In our 17-plus years in the garage door business, we’ve seen firsthand that postponing a repair often leads to the need for even more costly repairs later on. This is especially true when it comes to damaged or broken springs. If you notice a problem with your springs, call Carroll Garage Doors for garage door spring repair Sherman Oaks CA immediately. A broken garage door spring can be a big problem. Trying to raise or lower a garage door on a broken spring can burn out your garage door opener motor and potentially damage other parts of your garage door system. Depending on how heavy your door is, you may not be able to open it without a functioning spring to provide lifting power. Don’t let a broken spring trap your car in the garage. 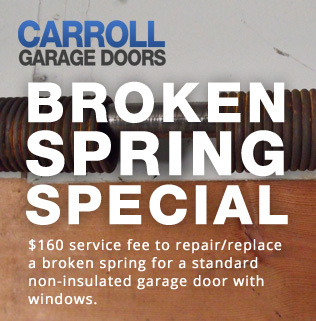 You can greatly reduce your risks of a spring breaking on you by getting regular inspections from Carroll Garage Doors. We’ll examine your springs for signs of wear and replace them before they actually break. While springs are probably the most critical part to replace early, we can also replace any other worn parts of the system that may be revealed by the inspection to give you superior garage door performance.